@eatnik got all excited when she told me about this place. We were meeting up at Chillipadi Mamak Kopitiam for a pre-pub trivia dinner, but we’d both arrived early, so we wandered up towards KFL so I could buy some pantry goods, and she could show me ‘the new offal place’. I was a little skeptical at first, because of their big printed lunch time specials poster in the window, and the fact they had spelled Barbie like the doll. But a quick flick through the menu out the front took me from a state of skepticism to a state of anticipation. The menu promised all sorts of braised, fried and grilled offal, amongst an extensive selection of typically Sichuan and Shanghainese dishes. Our fist visit was on a Saturday afternoon, and much to our chagrin, we were informed that the grilled items on the menu were only available at dinner. A couple of sighs later, we settled on – as you will see – a banquet of other goodies from the menu. The menu is quite an interesting read. The translation into English seems to have been done by google translator, as it doesn’t quite build in the cultural nuance of Chinese dish names. Witness the prime example: Saliva Chicken. A more common – and appetising – translation of this would be ‘Mouth-watering Chicken’. It’s boiled chicken, served cold, with a sauce of chilli and Sichuan pepper infused oil, with some chilli, garlic and spring onions. It’s meant to be served cold, but I thought it was a little too cold; in that way that eating chicken out of the fridge leads to chewing through meat which is super-solid. Flavour-wise, though, it was great. There are also some glaring inaccuracies on the menu. This dish was described as beef lungs – they don’t mince words in their menu, be prepared to see the word gizzards a few times – but it was a mixture of liver, heart, and brisket. There might have been some lung in there too, but I’m not too sure. 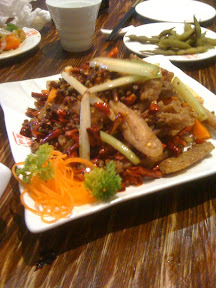 In any case, the flavour was good – spicy and salty, with a sour twang from some Sichuan pepper. I wasn’t going to go to a restaurant that specialises in offal and not order tripe, right? 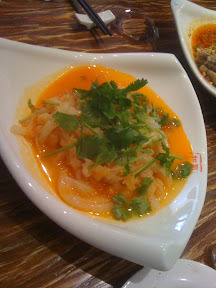 This was tripe, served cold, in a chilli oil sauce. Seeing a trend here? This sauce didn’t have the Sichuan pepper, however. There was a bit of vinegar in there though, which helped cut through the richness of the chilli oil. I absolutely loved this dish. 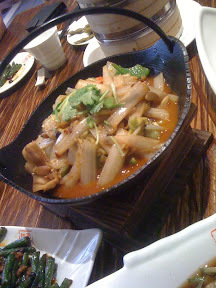 The texture of the tripe was great; springy and toothsome, yet soft and chewy. And let’s face it, when you’re eating offal, it’s often all about the texture. Need some respite from the offal? How about some more conventional dishes. 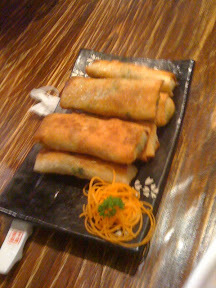 These are listed as leek pancakes in the menu, but the waitress explained to us that the chef prepares them differently. At this point, I was starting to wonder if they’d just taken the menus from some other restaurant. Anyhow, they came out more like little flat spring rolls. The filling was made of leek and egg, and they were delicious. Crispy and not too oily, the outside had that lightly flour-dusted feel to it, like on a good spring onion pancake. 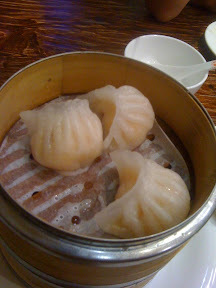 We ordered a serve of the xiao long bao, which weren’t quite like your average XLB. 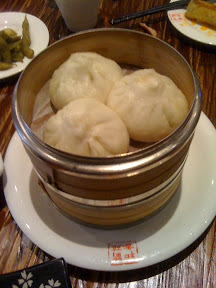 Unlike the prevailing style, these XLB were fat and puffy, more like a bao (steamed bun) than a dumpling. They were somewhere in between, and they were awesome! We’d let them sit a little while, as the food was coming thick and fast by this stage, so unfortunately, the soup in them had been mostly soaked up by the bun casing. We had these again on our return visit though, and they were still juicy inside. So juicy I managed to squirt all over my t-shirt! This was a bit of a weird dish. 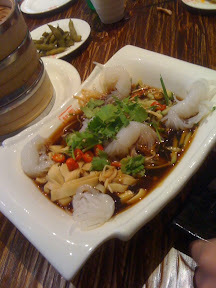 Bean curd skin strips and little bundles of rice vermicelli, swimming in a bowl of black vinegar sauce. It wasn’t terrible, but it also wasn’t worth trying, in my opinion. I think there might have been some sort of protein in there too – like fish? – but I can’t remember. Clearly, don’t waste your time or belly with this one. The opposite goes for the next dish. 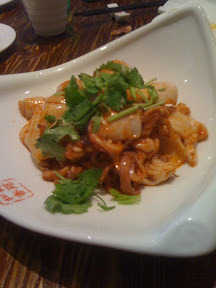 Called the ‘Spicy ink fountain’, it’s a cold dish of baby squid, in a – you guessed it – sour, spicy sauce. I just want to point out that despite most of these dishes having a sour and spicy sauce, none of them actually tasted the same. 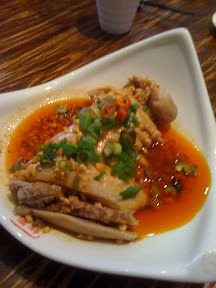 The varying combinations of chilli (both dried and fresh), vinegar, salt and Sichuan pepper meant each dish had its own unique flavour. The baby squid was to die for. Again, served cold, this squid was just barely rare. Not chewy in the slightest, the texture was springy and delicate. We thought perhaps we should have some vegetables with all of this protein, so we ordered some fried beans with mince. Yeah, this restaurant is not the place to go if you’re dining out with vegetarian friends. These beans were OK, but nothing special. I would have liked them to have been fried at a higher temperature, so they become a little more crispy, and get a looser skin, before they’re stir-fried with the mince and chilli. This dish was something of an unexpected fail. We’d ordered a mushroom dish, but what came out was a dish of braised Chinese cabbage and belly pork. In all fairness the waitress had said something when we ordered it, but it was a little hard to decipher, so I just nodded. And it wasn’t a bad dish at all, it just wasn’t a dish of mushrooms. So just be aware if you order mushrooms from the menu, you might get pork. 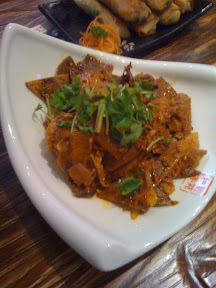 The final dish, and for me, the absolute star of the spread, was the spicy deep-fried pork intestines. Fried so that the outside was crispy, yet the insides weren’t overly chewy, and then wok-tossed with five spice, chilli, garlic and Sichuan peppers, these intestines were so more-ish. They’d be a perfect beer snack, too. And even @eatnik, who isn’t a fan of intestines, was a fan of these. That being said, intestines are an acquired taste, and Mr J, who tried them for the first time here, wasn’t a fan. A large part of the allure of this place is the extensive list of grilled items. So we organised for a return visit on another night. True to their word, the grilled items were available on our return visit, though there were some marinated duck gizzards which weren’t available either time. 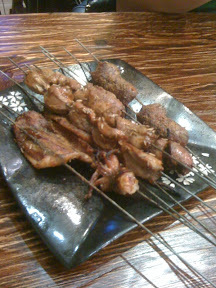 We ordered some grilled baby squid, chicken hearts, and lamb kidneys. The servings are calculated per skewer, so if you’re not sure about something, you can still try it without committing too much! The stand-out here were the chicken hearts, but they’re always great, in my book. The lamb kidneys were a bit over-cooked, and dry, so I’d avoid them next time. We also got some grilled eggs, which were dusted in turmeric and fennel seeds. 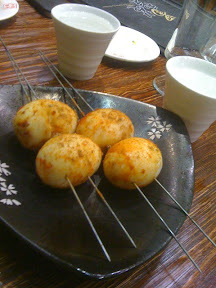 I wanted to like these more, but they reminded me of son-in-law eggs, where the hard boiled eggs are deep fried, only instead of the crispy fried skin, these eggs had a tough, chewy exterior. 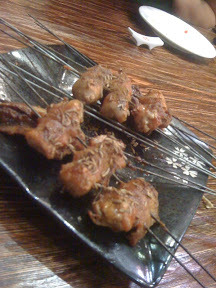 We also got a couple of skewers of enoki mushrooms wrapped in pork. These were great! The slightly charred pork, again liberally spiced with fennel and cumin, encased the enoki mushrooms, which remained juicy and soft. 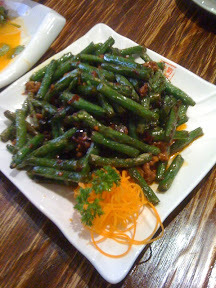 Again, needing to up the vegetable quotient of the meal, we ordered a cold dish of cucumber and bean curd skin. This was tasty, but could have done with a bit more chilli. I ordered the prawn dumplings, expecting something like a prawn version of a jiaozi or gyoza. What arrived was actually a version of a har gao. Not that I’m complaining, it was just unexpected. And the skins were a little too thick. The filling was tasty, though. Finally, we ordered the ‘Three generations Fish’. 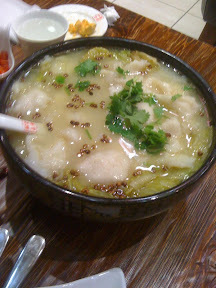 This was slices of fish that had been coated in a thick batter before being poached – or maybe there was a flash-frying process involved – in the soup. There’s a similar version of this dish in most Sichuan restaurants, only the fish is usually swimming in chilli oil, amongst the detritus of dried chillis. Not so here. The omission of chilli – but not Sichuan pepper – meant the dish wasn’t stupidly hot, and allowed the flavour of the Sichuan pepper to shine. The fish, with its soaked batter jacket, was an interesting texture. I quite liked it, but @fatbooo wasn’t as much of a fan. 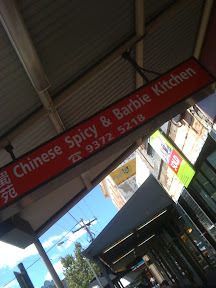 All in all, Chinese Spicy and Barbie Kitchen is an interesting place, with many items on the menu you won’t easily find elsewhere in Melbourne. If you’re a fan of chilli and spice, and you’re not perturbed by offal, definitely hit it up soon! I hadn’t been to Laksa King in a couple of years. It had since changed locations, and I’d heard varying reports about the quality of the laksa. Some people had said the quality had gone downhill, an others reported being quite pleasantly surprised that the change of premises hadn’t meant a change in quality or taste. So there was only one thing for it: I’d have to see for myself. I ordered the combination laksa. I can’t remember if it was called the Laksa King special laksa, but that sounds like something I would order…? Anyway, it came laden with slices of fish cake, a couple of prawns, some sliced chicken, puffs of fried tofu (my favourite part of any laksa) and a huge plump oily chunk of eggplant. Oh, and in case you’re wondering, oily isn’t being used in a negative way here. The soup was a heady mix of coconut milk and curry spices, and though others have claimed Laksa King’s soup doesn’t carry enough depth of spice, I have to disagree. It was enough to have me sweating within a few minutes. Though then again, I do tend to sweat quite easily when chilli is involved. As you can see, I quite enjoyed this laksa. Then I was at Highpoint Shopping Centre not long after, and I had heard that Laksa King had an outlet there. In the name of research (and not having eaten breakfast that morning) I decided to try the same combination laksa. It was a little disappointing, given the fact that the girl behind the counter had bothered to ask me whether I was eating in or taking away, that I was served a laksa in a disposable plastic bowl. Combined with the disposable chopsticks and the thin plastic soup spoon,it made for a truly food court experience. Which is fair enough, I suppose. I was eating in a food court, after all. The quality of the laksa, however, was definitely above your standard food court fare. Again, the (smaller) bowl was laden with seafood, chicken and tofu, though the soup was noticeably less spicy – perhaps catering to a wider audience? – and was a little overly coconut-ty. So my verdict? If you’re out and about in the West – and you’re most likely in a car if you’re visiting Highpoint – take the trouble to drive over to Flemington and have the original Laksa King laksa. It’s much better than the food court facsimile. Though in all honesty, if you read food blogs with any regularity, you probably didn’t need me to tell you that. It was a little bit of serendipity. Belly filling serendipity. I had to meet up with @jeroxie and @eatnik to plan an upcoming event, and the only time we could all squeeze it in was before their dinner with the @eatdrinkstagger crew at the Abyssinian. Wait, what? You guys planned a dinner at the Abyssinian without me? Oh, someone cancelled and there’s an opening at the table. Sure, I’ll come along! So nine of us trundled down to Racecourse Road, through the insipid Melbourne drizzle, and spilled through the door into the warm, vibrant interior of the Abyssinian. After a cursory glance at the menu, we unanimously decided on the set banquet (with meat – there is a vegetarian option, but that’s not how we roll) and added a beef dish. The beef dishes contain raw beef – think beef tartare – so aren’t part of the standard banquet. We also took the chance to sample a few of the Ethiopian beers on the menu. I recommend the St George. It’s a pretty light style beer, which goes well with the mild curries served up here. As there were nine of us, we were presented with three huge platters, each lined with injera – an African flatbread which has the spongy texture somewhere between a pancake and a crepe. Injera has lots of little bubbly holes in the surface, which makes it especially great for slopping up the sauces of the stews and lentils with which it’s served. There’s also a great little tang to the injera itself. The injera comes topped with the various stews and curries that it is the accompaniment for. From the top, clockwise: braised vegetables, goat, lentils, chicken, beans, fish, more lentils, lamb. 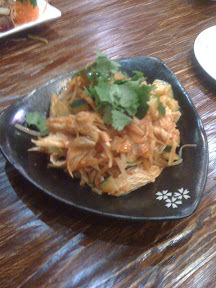 @jeroxie commented on the incredibly low overheads for the restaurant, as the way you attack such a huge share dish is with your hands! So no washing up of cutlery, and we were provided with little paper plates. I love this style of communal eating. There’s something about sharing food and diving in unadulterated by cutlery that just seems so much more personal and close than even sharing dishes at your local Chinese restaurant. I guess it’s got something to do with the fact that you’re counting on each other to have clean hands? Nothing like an implicit contract of hygiene to bring people closer together. Each of the stews were good in their own right, but my favourites were definitely the curried chicken stew (very similar to a Malaysian curry, funnily enough, but without the strong coconut milk presence) and the darker version of the lentils. They had quite an great kick to them, where the yellow lentils were a lot more mild. The beef dish was someting of a disappointment. I was expecting an intense, raw beefiness to hit me when I put it in my mouth – I’m a fan of rare/raw beef, for those of you who don’t know about my yukke and pho obsessions – but the beef seemed to have been somehow tempered with salt and oil. It seemed less raw and almost a little bit cured. Not altogether unpleasant, but definitely not what I was expecting. In a mammoth team effort, @jeroxie, @th0i3 and I managed to finish our platter. Then we groaned about our full bellies for a couple of minutes, before @th0i3 and I ordered the ‘cream caramel’ for dessert. Yeah, I was a little bit dubious about creme caramel being served as a dessert at an African restaurant – we used to serve a packet one at our restaurant in Swan Hill – but the yearning for something sweet to finish off the meal was too great. It came out, and after one spoonful, I knew I was not going to leave any of that deliciousness in the bowl once I was done. I’d definitely recommend you head down to the Abyssinian if you haven’t been there yet. Head down with a group of your besties, and feast it up. Just make sure you wash your hands beforehand!